Today I will show you a technique that most pixel artists use called dithering. Using this technique, we are going draw a small tilesheet that can be used in a tile map editor. Before we begin, make sure you have your favorite graphics editor, and a tile map editor installed. Let’s begin! 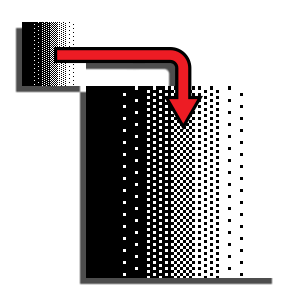 Dithering was a technique most artists used when creating 8-bit games. Since 8-bit games were limited to rendering 8 colors, this technique was used to transition two different colors. Dithering is best used for shading and highlighting. 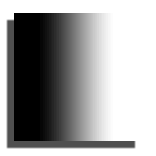 The image below is an example of dithering using black and white. These are two totally opposite colors, but as you can see, with the dithering technique these two colors blend quite nicely. There are several ways do use dithering techniques, you can experiment with different patterns and see which one blends best. My favorite, however, is the example image I just showed. Keep in mind when working with tilesheets, you want the images to be seamless. That way when you use them in a tile map editor, you don’t see any gaps. Unlike the past, our modern computers can render several different colors, so we don’t necessarily have to use this technique. However, people today love the retro-style look, it has become more of a style of art. Now that you have an idea of what dithering is, we can get started on our tilesheet. Let’s begin! Pick a light source first. Most of my previous tutorials, the light source was the sun, and it was always coming from the top. In this case, however, it’s an interior object. The light source, in this case, may be a light bulb, a lantern, candles, or any man-made lighting object. In the level, I may want to place the lights between each pole, so the highlights will appear on each side of the pole. Now that we have this figured out, add a little bit of your shading color, but don’t overdo it. Remember, we will be using the dithering technique to blend the colors. Add you highlights to both sides of the poles, but again don’t overdo this. Since the brass part of our wooden pole is more reflective, we won’t worry too much. The dithering will be done on the red painted part of our wooden pole. To make sure we can stack the middle tile, we will focus first on that. I like to use a select tool, to select that particular tile. To do this in photoshop, grab your select tool and move your cursor to the canvas. Hold down the shift key, click the left mouse button and drag while still holding the shift key. This makes it so you can select a perfect square. Drag it until you have a 32×32 pixel square. If your ruler isn’t set to measure in pixels, go to Edit > Preferences > Units & Rulers. Then in the units section, change rulers to pixels. To make sure you have the selection in the middle tile, drag your 32×32 selection to the top (Not using the move tool). Now drag your selection down. If you’ve noticed, now you can see by pixels, how far you’re dragging the selection. You want to move down by 32 pixels to get the selection to the middle tile. Dither your shading first, then the highlights. Make sure your dithering is in an even patten. That way we can stack our middle tile. Complete the rest of the image by dithering the top and the bottom part of the pole. If the patterns match evenly, then you’re done. I hope you have enjoyed this tutorial, don’t forget to like, comment, share, and subscribe. Tagged Dithering Technique 2016, pixel art 2016, Pixel Art Dithering, pixel art tutorial.